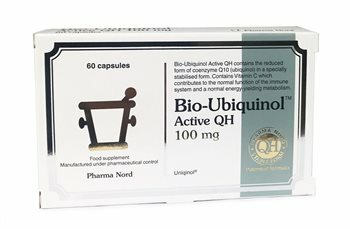 Bio Ubiquinol Active QH contains the reduced form of coenzyme Q10 (ubiquinol) is a specially stabilised form. Contains Vitamin C which contributes to the normal function of the immune system and a normal energy yielding metabolism. Bulking agent: Coconut oil, Capsule: Bovine gelatine, Coenzyme Q10, Humectant: Glycerol, Colour: Ammonia caramel, Vitamin C (as ascorbic acid), Antioxidant: Ascorbic acid, Thickener: Silcon Dioxide, Antioxidant: Mixed tocopherols. 1-3 capsules per day or as directed by a physician. This product is a must for anyone over 40 .